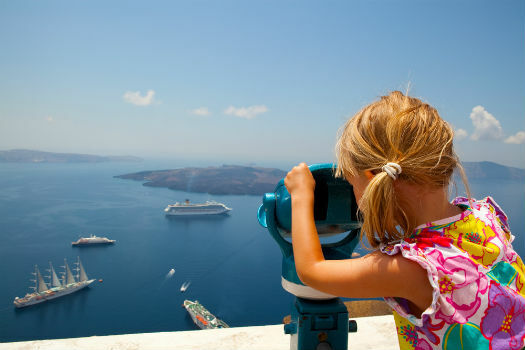 Enjoy your holidays in Greece with Pyramis Holidays, the Greece's Holidays Experts. We offer Beach holidays, Cultural, Historical and Religion tours all around Greece. Visit Athens the most historical capital of Europe and combine Island Hopping in Mykonos & Santorini. Cruise at the Greek Islands and visit the birth place of Olympic Games, Olympia & the Ancient theatre of Epidaurus. Our expertise, which ages 40 years in the Greece Incoming Tourism business, guarantee you an unforgettable experience to our beautiful country at the best possible rates! We offer you also online booking to hotels in Greece, airtickets from your home country to Greece and ferry tickets for the Greek Islands. On this tour you will combine the history and culture of Athens while enjoying beach holidays and touring in one of the best island on earth, Santorini. This package combines the history & culture of Athens with the crazy, glamorous nights aliong with swimming to the sandy beaches of the island of winds, Mykonos. Combine Athens the modern capital of Greece & Nafplio the historical capital plus touring the most ancient cities of Peloponese! Observe the striking contrasts of Athens while cruising along the Aegean Sea and visit the most polpular islands of Greece, Mykonos & Santorini! You will visit the most archaelogical sites and museums, and experience the glory that was Classical Greece. Explore the glory of ancient Greece with this five day classical tour from Athens. With this unique tour visit and enjoy five UNESCO'S world heritage sites. This package is perfect for anyone looking to relax, wander around Thessaloniki, travel to close famous destinations like Meteora and Vergina! Chania is surrounded by numerous rich options for sightseeing, exploration and discovery. Corfu is one of the most visually exciting regions of Greece with its variety of natural beauty, exotic scenery, magical colours, flaming sunsets. One of the best seeling tour. Combine the two most popular and picturesque islands of Greece. This package combines the fascinating scenery of Santorini with the most beautiful sandy beaches of Cyclades, in Naxos Island. This package combines the largest Island of Cyclades, Naxos & the smallest island of Cyclades Koufonisi, which is famous for its tranquile beaches. This package aims to show you the beauties of Paros & Naxos.Explore the natural treasures of Paronaxia while cruising to Small Cycaldes & Antiparos. Beach Holidays at the boast beaches of Chalkidiki. Choose among three peninsulas, each one with unique charm, historic & magic. The place where religion, history, green forests and blue sea come together! Timeless scenic villages, ancient monuments, and mediaeval castles, rich history,natural beauty and spectacular beaches make the Peloponnese a year-round holiday destination! Combine your tour in Greece with a tour in the Holy Land of Israel of general interest. After your tour in Greece you have a chance to travel to the neighbour country of Egypt and explore the treasures of its capital, Cairo. Enjoy a package tour in Istanbul which is only 1 hour by flight far away from Athens and explore the former capital of Byzantine Empire. Find here the best hotel offers for beach holidays in Mykonos, the island of winds. We can arrange for you excursions and tour all around the island. Holiday Packages to Evia Island, Aghia Anna, Eretria, Chalkida, Nea Styra, Marmari and Karystos are few of the most beautiful destinations where you can choose from! Easy and cheap access from Athens..
Crete simply has it all! Crete is, after all, a small universe teeming with beauties and treasures that you will probably need a lifetime to uncover! This tour explore Alexander the Great footsteps at Macedonia. We visit Thessaloniki, Kastoria, Kalambaka - Meteora and the treasures of Vergina. Enjoy a combination of nature, antiquity and customs. In this tour you will visit the most historical cities of Peloponese, Nafplio, Sparta, Monemvasia and Githio! Discover the spirit of Ancient Greece through a fascinating journey by vsiting the historical cities of Peloponnese, Nafplio, Olympia and Kalamata. Odyseas & the Ionian Islands! Visit great monasteries in Greece and learn everythind about ancient Greece. Book Online and enjoy your trip! This tour package is based on footsteps of St. Paul the Apostle, in Athens, in Corinth and then at Patmos Islands to admire the Monastery of St. John also the Grotto of the Apocalypse! Visit the Mount of Athos, the Monasteries of Meteora, Ancient Market in Korinthos, Gortyna Crete and the beautiful Island of Santorini! Explore with this guided one full day trip from Athens to Argolis the remains of the ancient city of Mycenae. A half day afternoon trip from Athens full of images. Begin your Sounio tour with a wonderful drive along the scenic coastal road which affords a splendid view of the Saronic Gulf. From the Acropolis to Omonia Square, with the half-day sightseeing and Acropolis museum tour you'll see all the famous sites of ancient and modern Athens. From the Acropolis to Omonia Square, you'll see with this full day trip all the famous sites of ancient and modern Athens. Depart from our terminal for one day trip from Athens to Delphi to explore one of the most famous archaelogical sites of Greece. Don't miss the opportunity during your stay in Athens to visit the breathtaking Meteora Monasteries with this amazing full day rail tour!